Croatia's discovery continues, with wine experts now realising what locals, and those in the know, have been aware of for many years. The recent Decanter World Wine Awards gave eight gold medals to Croatian wines, whilst Argentina could only muster, seven and Chile four. 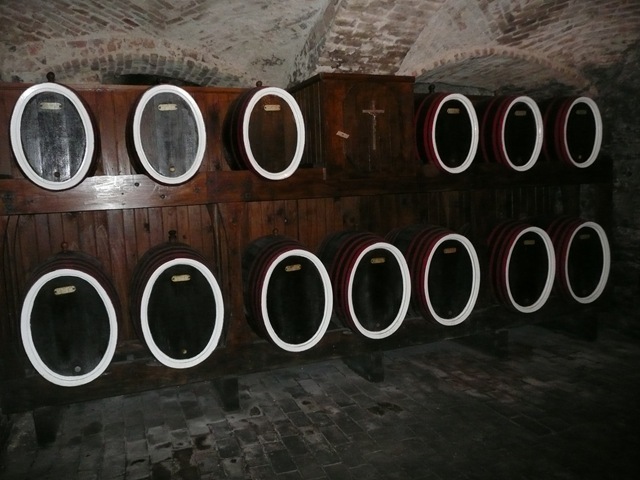 Today's photo is of the Bishop's wine cellar in Đakovo, Slavonia - tells you a bit more about this and it's interesting to note that nearly all the medal winning wines came from continental Croatia. One of the gold-winning white wines was the Bodren Pinot Sivi, costing about L35 a bottle, and was described by the judges in their tasting notes thus: "Toffee apple, clove, smoke with a silky sugared texture and persistent lingering finish." While supermarket wine buyers have become increasingly adventurous in recent years, stocking more English wines, Austrian fizz and unusual sherries – another big winner in the Decanter awards - no mainstream retailers sells Croatian wine in Britain. Shoppers will need to find a specialist importer or join the increasing number of holidaymakers that have discovered Croatia and its wines in recent years. Milijenko Grigich, a Croatian who has become one of the most successful Californian winemakers, has argued that the Plavac Mali - one of Croatia's main red grapes – is in fact the original variety from which Zinfandel, or the Italian Primitivo grape, is derived. Croatia has won an astonishing eight gold medals at this year's Decanter World Wine Awards. Angela Muir, the acknowledged expert on the region's wine, explains what makes them so good. I went to a fascinating tasting in Zagreb, the capital of Croatia, earlier this year. It was the kind of civilized affair that importers and retailers in Britain might dream about: heaving with eager, yet well behaved yuppies, all anxious to understand and enjoy their own and other countries' wines. The Dalmatian coast and islands produce everything from some of the soggiest, overripe reds on the planet to some truly intense, well balanced ones that should develop beautifully in bottle. Inland, the hills not too far from Zagreb have a similar potential to that of their neighbours in Slovenia to produce great examples of tangy, appetising, definitively cool climate whites from a whole range of grapes. Many of these white wine producers are still making concentrated, long-lived styles that need cellaring until they soften out but a few are making the more forward, lifted, user-friendly styles that we now recognise more easily in the "West". There is a lot of often heated discussion about what is the "right" way to make wine from a specific grape type or region. From my point of view, it is fantastic that the Croatians haven't yet succumbed to following just one or two style leaders. I very much hope they never will. A small warning to holiday makers, and those determined enough to track down Croatian wine back in Britain - you will have to seek out the goodies and pay over the odds. The best bottles can cost more than L30. It's a hit and miss business and the Croatian yuppies have got there before you. Angela Muir is a Master of Wine and a leading wine consultant.